If you haven’t made muffins with sweet potatoes yet now’s the time to start. I mean, who doesn’t love a good muffin? Easy to make, easy to grab on the go, and fun to say. 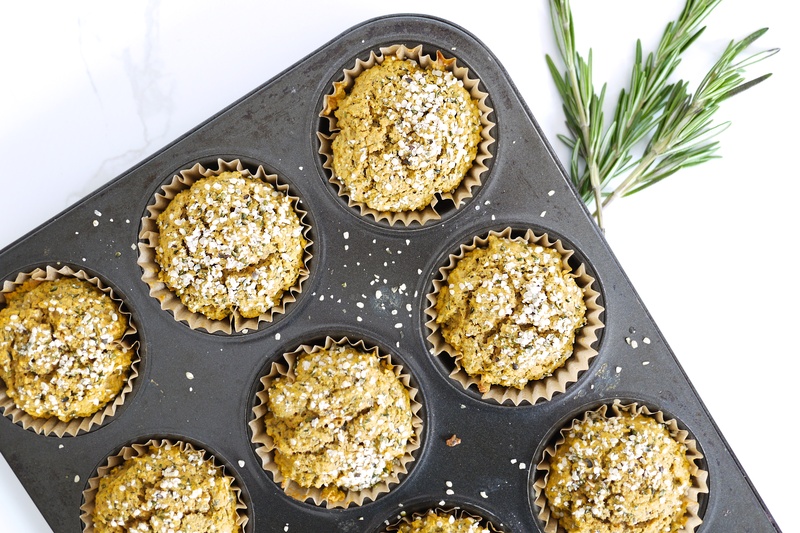 But seriously, these cute little, healthy, protein and fibre packed muffins are going to be your new favourite snack. 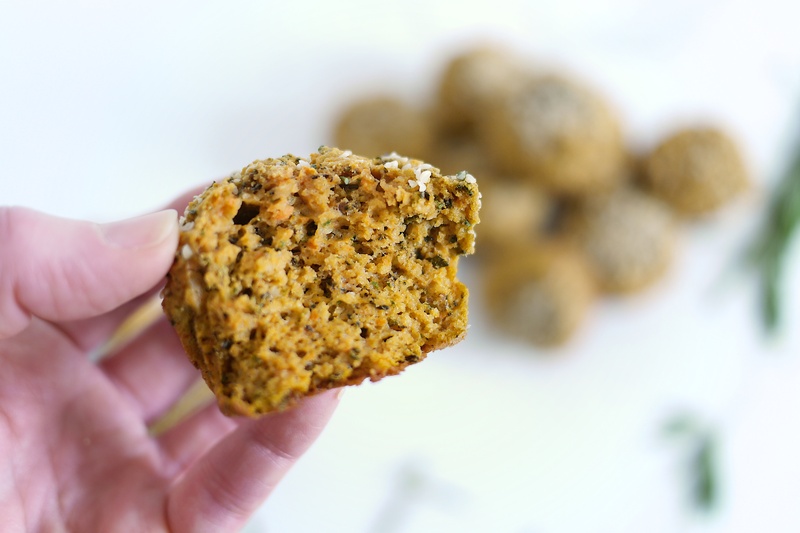 Even though they’re dairy free and gluten free, there’s something about the savoury, sweet combo with the herbs and orange-y colour that totally reminds me of the kinds of cheesy scones that I used to devour when I was a kid back in Nova Scotia. We Scotians love our scones. 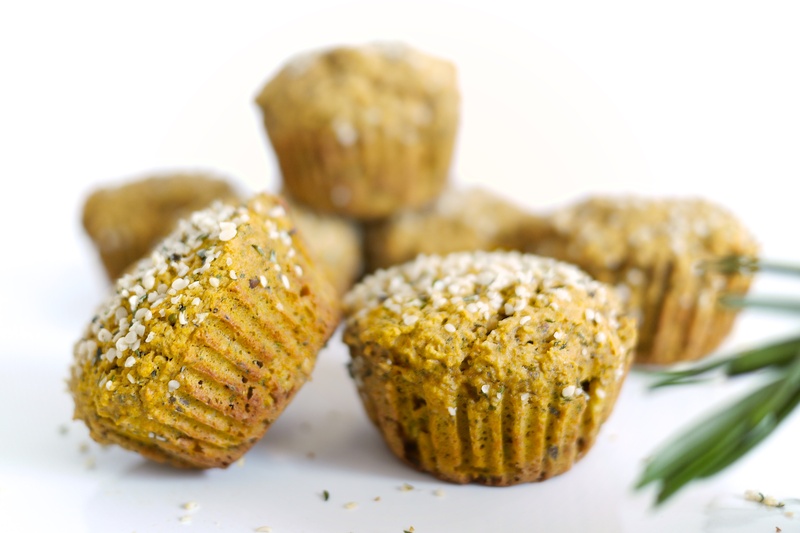 These savoury sweet potato muffins make a great breakfast, energy snack and, just like scones, they’re great reheated in the toaster oven as a tasty sidekick to a good bowl of soup. 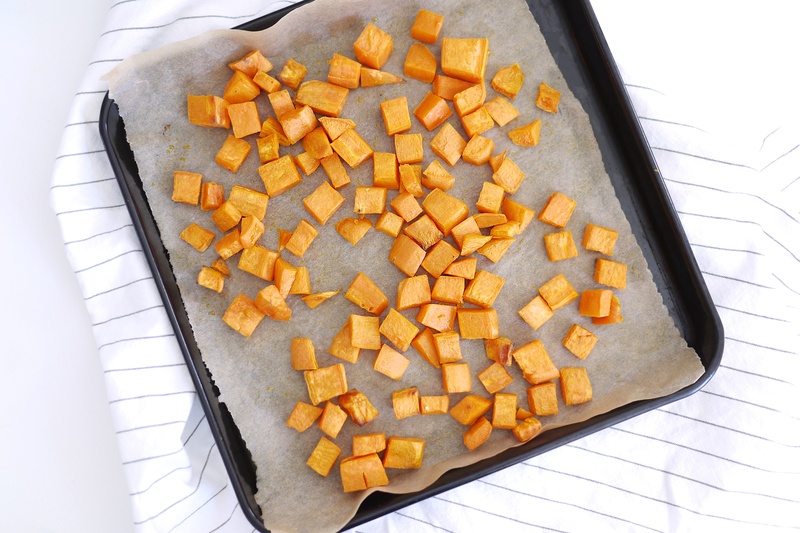 Using cooked sweet potatoes as a base not only makes this recipe rich and flavourful but also provides an awesome antioxidant boost from all the sweet beta carotene. Beta carotene gets converted into vitamin A which is Awesome for eye and skin health and boosting your immunity. 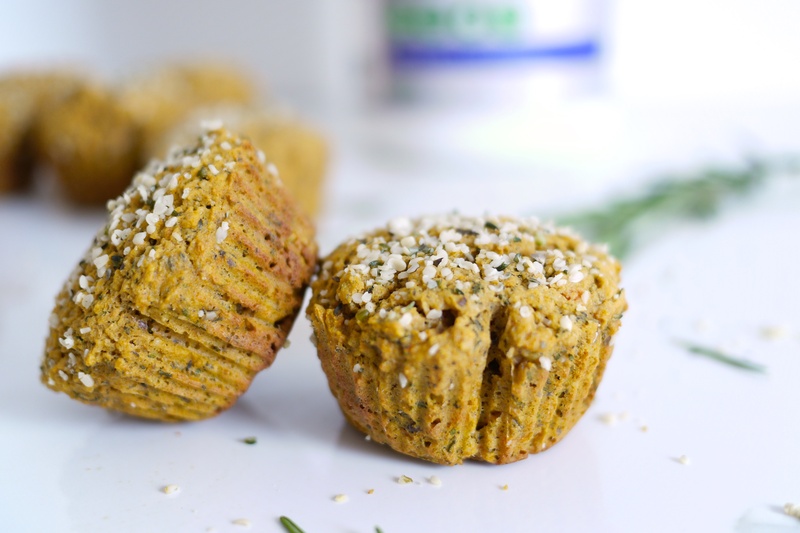 Plus, these babies are truly blood sugar balancing with great amounts of fibre, protein and healthy fats. Those tasty tubers, oat flour and flax will give you a good mix of both soluble and insoluble fibre. And I made sure to load them up with good sources of digestible protein from 4 eggs and a scoop of protein powder so they help maintain energy levels through the day. Yes, you can cook with protein powder. Did you know that? I mean, a lot of people only add protein powder to their smoothies (and I’ve been doing that lately too) but you can also add it into baked goods to bump up the protein in those kinds of tasty snacks too. I’m consistently working to improve my digestion because it suffered a lot of abuse in the past (sorry, digestion) and we made a pact not to go back to that bad place. So, when I decided to experiment with upping my protein intake with a supplement, I knew it had to be a fermented, plant-based product. By now you know I’m a BIG fan of fermentation. Not only does the fermentation process maximize protein and nutrient absorption, but it also strengthens gut and digestive health, which is a big bonus. I mean, who wants to be bloated and gassy after trying to eat well? Not me! Like I said, all those nice nutrients only benefit us if we’re actually digesting and absorbing them properly. 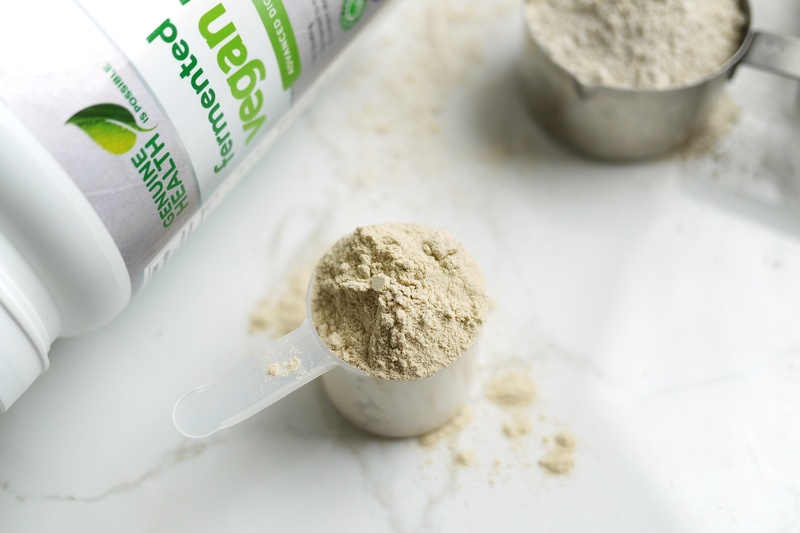 Fun fact: fermented, plant-based proteins are actually absorbed and utilized by up to 40% more than unfermented. Oh snap! Also, keep in mind, if you decide to bake with protein powder, you need to make sure you’re balancing out with enough fat and moisture otherwise your recipe will be too dry. That’s why there’s a generous glug of coconut oil, lots of eggs and pureed cooked sweet potatoes which all help to balance the dry ingredients. If you don’t or can’t do eggs, you can easily replace each egg for 1 chia or flax egg (made by combining 1 tbsp of ground chia/flax with 3 tbsp of water and allowing to sit for at least 5 minutes). You can use fresh or dried herbs depending on what you have on hand. If you’re doing dried, just add less since they have a more concentrated flavour. I usually just cut the measurement in half when I’m using dried herbs. 2 cups cubed cooked sweet potato (approx. 1 cup once pureed). Oil or line muffin tray. Puree all wet ingredients in food processor. 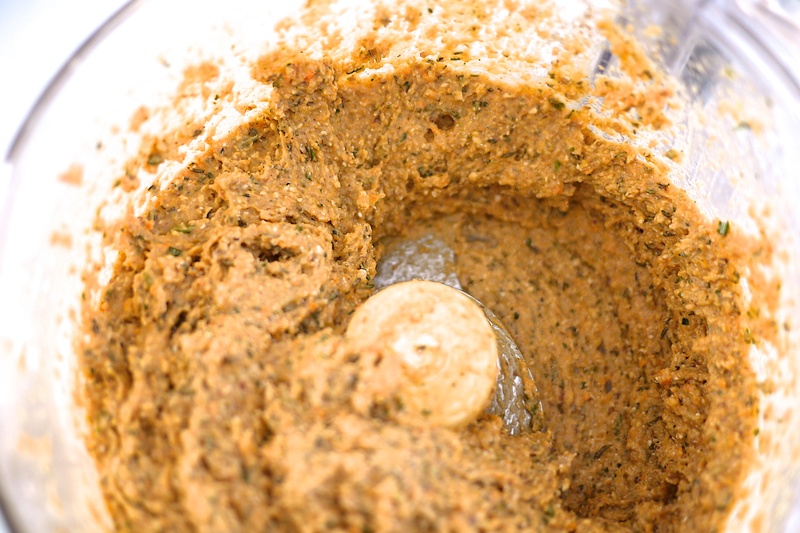 Add all dry ingredients directly into food processor and pulse until well combined. Divide muffin batter evenly into muffin tins (it’s a bit sticky). Bake 20-25 minutes until toothpick inserted in centre comes out clean. Let cool slightly before removing from trays. Note: Store in airtight container in fridge up to a week or in resealable plastic bags in freezer up to 3 months. Would LOVE to know how it goes if you do try my recipe out. 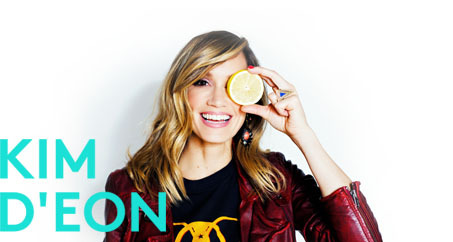 Make sure to click a quick pic and tag me @kimdeoncom on Instagram so I can … like your muffins. 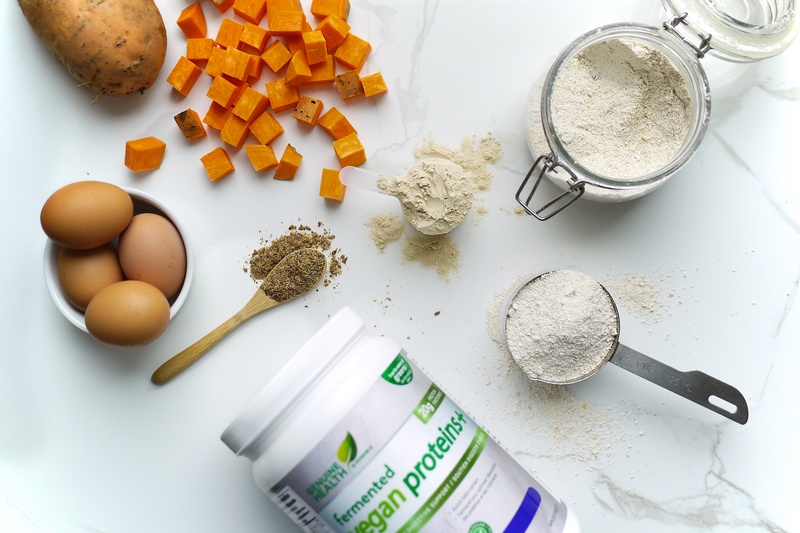 To learn more about Genuine Health fermented vegan proteins+ click here for more info on their site and if you want to whip these up using their fermented proteins, check out a list of retail locations near you, here!